3.21 "Snow Drifts" & 3.22 "There's No Place Like Home"
In tonight's humdinger of a two-part episode we find out that Zelena really is gone for good and it was just her residual magic from the pendant that opened the portal. I might possibly be a little excited over this. Maybe. In addition Emma struggles to figure out where she actually belongs, which gets even more complicated when she and Killian get sucked into the past and have to act as matchmakers for Snow and David while trying not to make everything worse. Which of course, they epically fail at - at least when it comes to Regina's happy ending. Again. And they manage to bring back another ... villain? from the Dark One's secret vault. Fantastic. Perhaps I should have recognized Marian; I thought she was vaguely familiar, but I was so caught up with Emma and Killian that I didn't realize it. So the ending was a bit of a shock to me. I can't wait to see how this plays out. I'm pretty much still waiting for her to encounter some horrific death to "course correct" the saving that Emma did. Looking at relationships on the rocks, Rumple's going to have all of this blow up in his face. His inability to relinquish the dagger for real, while lying through his teeth to Belle? It can only end in tears. However, I do have to say that Belle's and Rumple's vows were so perfectly perfect. "Sometimes the best book has the dustiest jacket." Love it. I adored the wedding scene and I'm really scared for the fallout when Rumple's lies are revealed. Home and family continued as major themes of this season. One thing I love is that the true love of family is consistently the love that breaks curses - it's more important than romantic love, more important than anything. Emma kissing Henry broke the curse, Regina's love for Henry broke a curse, and now Emma's realization of how important her family is allows her to regain her magic and travel back home. I am continually amazed with the way that Snow and David come across as parents/grandparents. It still makes me chuckle when Henry calls David "Grampa." 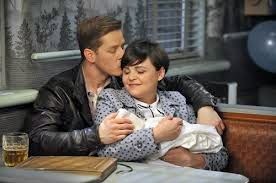 However, Emma's love of her parents at the end is purely sweet and perfectly played by all involved. The look on Emma's face when seeing her father for the first time in the past, along with her emotions when Snow and David begin to fall in love was absolutely priceless. From the moment she sees David on the road I knew she was starting to realize that she would miss them if she left - that home had arrived right under her nose. I am so happy for flashbacks where we get to see Neal even though he's dead. But I'm not entirely sure how I feel about the new baby being named after him... It's a nice gesture, but something feels weird about it to me. What do you think? I do love that Neal is the one who taught Emma what home was and Hook is the one who helps her see that Storeybrooke, and him, are her actual home. Speaking of Hook *sigh* can we just talk about how flippin' adorable he was this entire episode. I have been super hesitant about Emma moving on from Neal so quickly, but the pacing on this two-parter made it perfect. Made it right. "One of these days I'm going to stop chasing this woman," Hook says. But the truth is, he doesn't. Every single time he needs to follow her, help her, be there for her he is. And selling the Jolly Roger in order to bring her back to Storebrooke? To save her family? To bring her back in contact with Neal? What greater sacrificial love could there be from Killian? He was basically my favorite throughout this whole episode and I'm totally shipping Swan/Hook now. Which means that Regina is probably going to do something stupid and ruin everything. Or Emma will. Or Killian will. It was adorably priceless when Killian got outrageously jealous of himself. I loved Emma's comment, "At least I know I'm his type." And I sort of feel like the consequence-less flirting she can do with past Hook in the bar allows Emma to face the development of her feelings for him. She couldn't act that way with now-Hook for many reasons, but they are the same man, technically, so she unwittingly opens herself up to the possibilities. NaomiRuth pointed out that Hook is really good at just rolling with the punches. He just kind of shrugs off and works with whatever curve balls come his way - except when it comes to Emma. She's pretty much the only thing that ever really discombobulates him completely. Which is probably why he has fallen so hard for her. When Emma knocks Marian out and says, "Then I guess we're kidnapping you." Hook's reply of "I always knew there was little pirate in you, Snow" and the look on his face was hilarious. I'm torn. On the one hand if they try to do "Elsa" in Storeybrooke, it's just way too soon after Frozen's release to play with it. AND Elsa is not actually a villain. And it wouldn't be interesting without an actual big bad. I read somewhere that Elsa was originally going to be more of a straight-up villain, but they changed the storyline of Frozen and made it a sister story, which I appreciated. Here's hoping that they do what they've done all along and don't stick to any original fairy story lines. Either way there are a lot of things to make next season interesting - Emma and Killian's blooming relationship, Marian's return and Regina's reaction, Rumple's deception and new marriage, the chaos of Emma trying to settle into her new life, and Snow and David's new baby. I did notice that without that final scene, this would have been a really sweet ending to the series. It made me wonder if they were unsure as to whether the show would be renewed. Everyone's happy ending would have been quite satisfying. But I'm glad we get to see more next season! Thanks for tagging along on our journey and I'll see you in the fall!